We teach you how to get out on the water and enjoy the many sights and sounds that nature has to provide. Who is the Floating Authority? Hey there, my name is Derek and I am the person behind Floating Authority. My love of being in the water started when I was 7 years old canoeing, fishing and snorkeling around the Great Lakes. 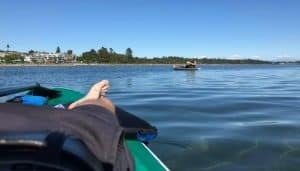 Since then, I like exploring my area kayaking and paddlebording any time I get a chance. Throughout my years of experience I am happy to bring you first hand knowledge in anything that has to do with watersports. Don't know where to start? take a look at some of these helpful guides I have curated.